These bath salts are organic and made with lavender and earl grey tea – I love the scent. We’ve received these in subscription boxes before and they are great (And organic!). These minis are perfect to keep in the pantry for whenever we need them too. 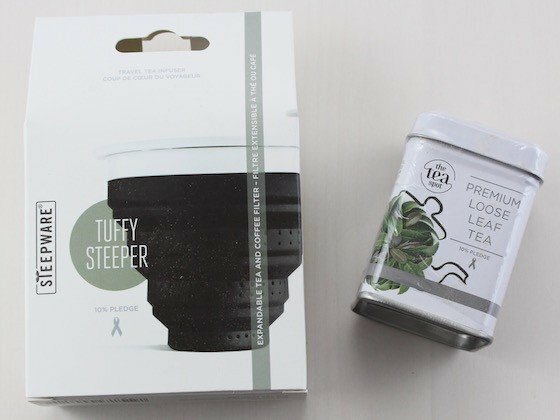 This tea steeper is collapsible, so it’s good for travel. It also is BPA Free and dishwasher safe. (And I love that it comes with a lid to keep your tea warm). This tea is made with organic green tea leaves and jasmine flowers. It smells great, and I’m a big tea drinker, so I’m very happy to see both of these items in the box. My husband LOVES toffee and immedaitely called dibs on this bar when he saw it in the box. And it was just as good as he hoped for! I love the scent of beeswax, but this little candle is so cute I don’t want to light it! Make a wish. Light the special paper on a plate. Magically, the paper will rise high to the ceiling or the sky & as it floats back down – catch it! Your wish has been released. Good fortune! Comes in gold or silver on the outer tube; wish paper is magenta. Sold per tube of 10 Wish Papers. If requesting a specific outer tube color, please note in the “Special Instructions” field upon checkout. Verdict: I think this is a great first box for Prospurly! The value is about $75.50, and I think that is a good value for this type of box with the cost at $45. All the products included are quality brands, and I appreciate the focus on natural and organic ingredients. They have a couple March boxes in their shop for a discounted price. I bought one which shipped right away. It arrived today. Just had to mention it’s been pretty humid here lately in Missouri and I have the soap still in the wrapper and it’s starting to ‘sweat’ through the packaging. Their box is such a good idea, so I hope they really stretch themselves to think outside the box! (no pun intended) They have a great opportunity, now that LLB has clearly disappointed so many people, to step in as the next big lifestyle box. I may give this box a try. I love the items that are featured in this box. I think I’m in the target demographic for this box, but at $45-50 a month I can’t do it. I might do it if they had a lower cost (less items) monthly box OR they had a quarterly box. Speaking of Quarterly boxes, I can’t wait for my quarterly (twice a year in reality) Design sponge box! I am being realllllly patient (was supposed to ship in March but will ship in May). I just ordered the steeper for a gift after I saw this. I may need to sign up for this box! I love the wish paper. What an adorable idea! I will be actively seeking these on the swap boards!!! I love locally handmade goods, but didn’t like this box at all especially for $50. I’m so over bath salts and freaking tea. I don’t drink tea at all and get it often in sub boxes. Sure it’s a cute box with a great idea behind it, but doesn’t deliver for me. I might keep it around another month and then cancel if it doesn’t get better. I posted both of them on the swap board. I got this box yesterday and absolutely loved it! It felt so classy to me; sometimes the Little Lace and Popsugar boxes are too “glittery” for me, or maybe young is the word. Haha, LLB did make it clear I wasn’t the target market at age 41 so I cancelled and switched to this. So happy! I can’t wait for my new splurge box to come next month. This box has an interesting mix of items in it. Yet I’m not entirely comfortable spending $45 a month on it just yet. This box has a lot of potential and i like the organic, naturalness to it, and no makeup. I’ll wait to see what next months spoiler is before I sign up. I would be more convinced to sign up if the box was under $40, was quarterly, or had more value to it. Great box! I may have to give this one a try….